One of the coolest recent additions to Android(s goog) has been Google Now, a quasi mind-reading app that pushes you relevant data based on your habits, location and other signals. Now, iOS(s aapl) users are poised to get a similar app though it won’t be coming from Google. 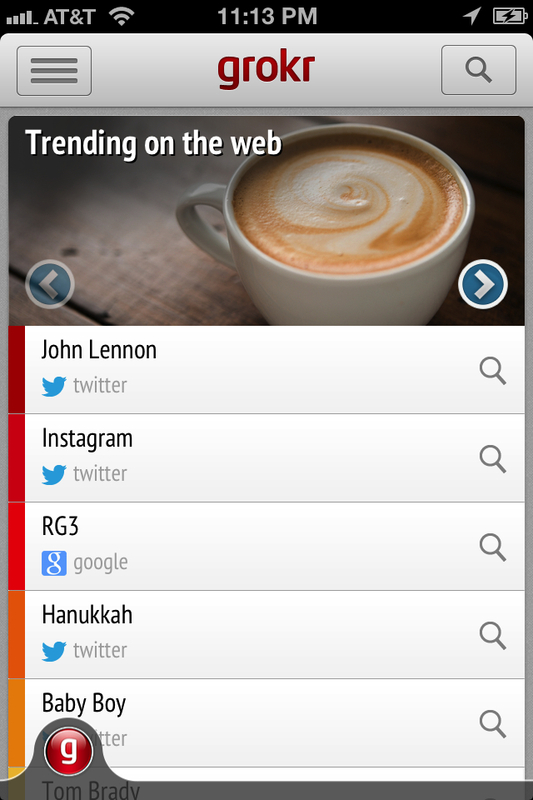 The new app is from a startup called Grokr, which was founded by former McAfee CEO and founder Srivats Sampath. The app, which officially launches in beta Wednesday morning, aims to predict the information that users want and give that to them without them asking for it. And when they do ask a specific question, Grokr takes them directly to an answer or a source, rather than to a bunch of links. Grokr tries to personalize its answer to a user based on a whole load of data it can gather through Facebook(s fb), Twitter, LinkedIn and more than 50 other sources. After a few weeks in use, Grokr can tell where you live, where you work, what kind of music you like and what teams you follow. It can even figure out a user’s ethnicity and demographic data though it keeps all of this anonymized. Then it pairs what it knows about a user with a knowledge base built on top of Freebase, which is also used in Google’s own Knowledge Graph. Grokr has built out its knowledge base with another 50 sources including Bing(s msft), Factual, Yelp, Songkick and others. Grokr has more than 700 million facts in its database, covering 25 million entities, which represent the meaning behind all kinds of words it comes across. When it all comes together, Grokr can tell you if there’s traffic on your route to work or feed you pre-game info on your favorite team. It can remind you of upcoming concert tickets for your favorite artist, show you trending topics tailored to your interests and even bring you personalized data reminders that cater to your demographic. Grokr does this through a handful of tiles that cover local information, breaking news. 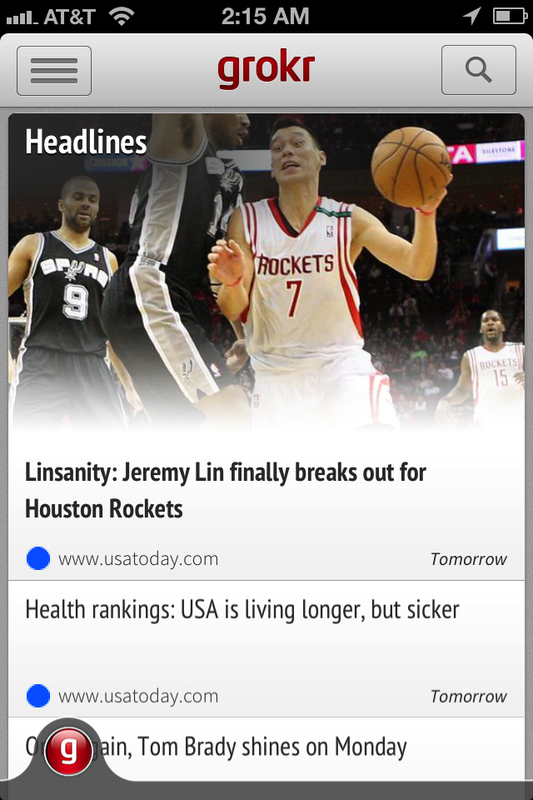 sports, trending topics and recommendations. This may sound like Google Now, but Sampath said it’s potentially more powerful because it’s not relying on Google products and services. By engaging with an array of data sources, Sampath believes Grokr can be even more prescient and helpful for users because it knows more about a user and can steer them to more data. “The differentiation is just purely the number of signals we have about you. We have a lot more than Google Now,” Sampath said. Sampath believes that Grokr has an advantage over Siri as well, which is still built around pulling data via voice. He said Siri doesn’t work in many environments and it’s not built for the future of mobile search, which is all about pushing data to a user. This does sound intriguing because it’s another sign of how our devices and apps can become even more personal in the way they cater to our needs based on data it can absorb. And I like that it acknowledges that search on mobile needs to be different, more immediate and intelligent using as much context as possible. But it can also be a little creepy. Sampath showed me how Grokr figured out he’s South Asian based on his name and then gave him a headline about the need for South Asians to get tested for diabetes, which Sampath actually has. I’m not sure how people will feel when an app starts to really understand someone. There will be moments of delight when you get a spot-on recommendation but you can also be taken aback when you realize the picture that forms when all of your data is put together in one place. Sampath, however, said that Grokr doesn’t identify a particular user, just looks at the collection of words and topics they represent. And he said Grokr will never sell or rent user data. If Grokr can gain a following, there’s some real money to be made. Google is the leader in local search advertising, which means a lot of search advertising revenue. Sampath believes that Grokr can build a similar monetization strategy presumably around search ads. Right now, it’s leaning on Bing to complete index-based search results. Grokr previously raised $4.2 million from NEA, U.S. Venture Partners, Triple Point Ventures and Lerer Ventures. What happened to the launch? Congrats to the Grokr team for building a truly innovative app and service! My startup, Alohar Mobile, enjoyed working with the brilliant team at Grokr on its location and context awareness features. 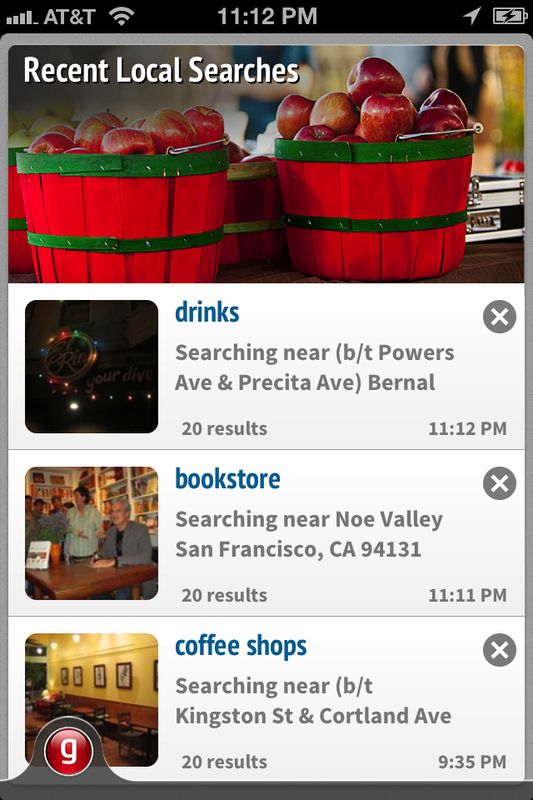 They made great use of our SDK & API to create a powerful new search app. This sounds like one of the coolest products to be launched, yet scares the crap out of me. Technology will eventually run our lives to the point where a sudden loss of tech will result in tremendous issues for society. But, pretty nifty, nonetheless. thanks. will make the fix.